Due to the pioneering work of many ophthalmologists, including Gonin, Lincoff, and others, the basic pathophysiology of rhegma-togenous retinal detachment has been established. A retinal tear is caused by a vitreous detachment and traction on the retinal tear, and peripheral retina is responsible for fluid currents, which go through the break and detach the retina. More fundamental questions remain to be answered and will have important implications for our ability to detect, prevent, and treat rhegmatogenous retinal detachment and its complications. 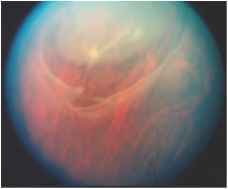 when intraocular lenses, retained lens material, and other difficulties preclude identification of all retinal breaks . Let us now consider the evolution of surgical techniques in the future. One of the many obstacles to performing minimal buckling techniques, as well as pneumatic retinopexy and the balloon buckle, is the difficulty in finding all retinal breaks in certain eyes as outlined above. New techniques will evolve to allow visualization of the peripheral retina, which will make break identification more universally possible. patients to be treated at earlier stages of the detachment, when the macula has not been affected, and the rate of success is higher. 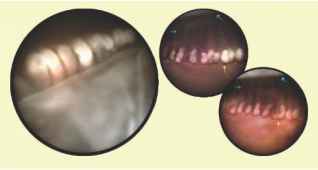 High-resolution scans, such as those used now for magnetic resonance imaging (MRI) scanning of the head and neck vessels, may become applicable to the retinal periphery and help with break localization and prophylaxis issues. Functional MRI may increase our understanding of peripheral retinal tissues as well. This technique may allow insights into vitreous and peripheral retina metabolism and degeneration and may help allow us to predict those at risk for early vitreous detachment and retinal detachment . Intraoperative techniques will evolve, and these will include even better wide-angle viewing systems and the future use of stereoscopic endoscopy, which will allow the advantages of stereoscopic viewing and tissue manipulation currently not possible with grin and other forms of endoscopy  (Fig. 10.9). New lasers may allow us to transect the flaps of flap tears, thereby relieving traction; if this is possible, retinopexy may not even be required, and minimal manipulations to close the break may be possible. Electron knives and other devices will be able to be used intraoperatively to allow tissue to be cut in a non-traumatic and, therefore, non-pro-inflammatory manner. 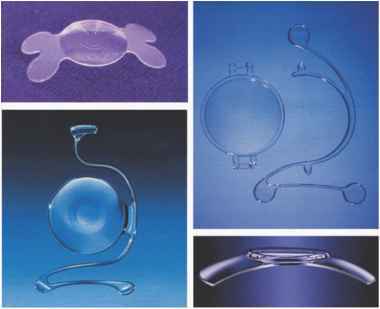 IOLs for presbyopia will also complicate our view in the future as their use becomes widespread (Fig. 10.12). Fig. 10.14. 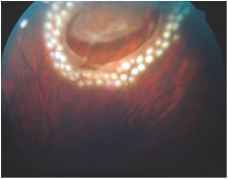 Stereo photograph of old giant retinal tear with cyst. Fellow eyes are at high risk trial techniques. 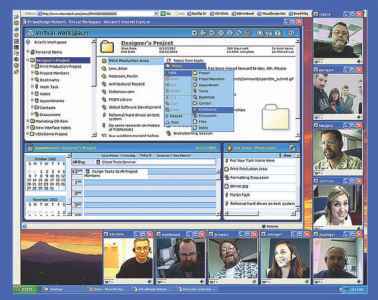 The network of academic collaborations will be able to be formalized, and individual physicians will be able to collaborate seamlessly. Clinical science will also advance as we learn more about genetics and other cofactors that predispose to retinal detachment. Our knowledge of who is at high risk for retinal detachment remains rudimentary. 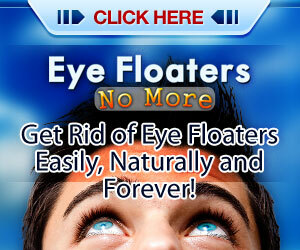 We know that fellow eyes are at risk, particularly in certain conditions (Fig. 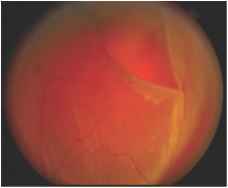 10.14); but there remains great controversy as to the role of prophylaxis of peripheral retinal lesions that may be related to retinal detachment. Clearly, as we learn more about risk factors, the role of different types of prophylaxis will become better understood. This, in conjunction with more facile ways to perform clinical trials and surveys, will allow preventive treatment algorithms to evolve. 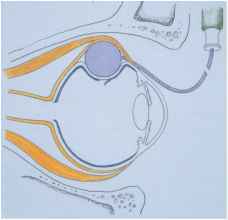 The pioneering work of Sawa and Tano in Osaka has shown us that it is not instrumentation of the vitreous itself, but infusing of fluids that is likely the cause of nuclear sclerosis and cataract induction after vitrectomy . As vitreous surgery is applied to eyes with relatively good visual potential, the side effect of cataract is more clinically important. Our indications for vitrec-tomy in the repair of retinal detachment and for other diseases may expand considerably if we can avoid cataract formation in these eyes. Fig. 10.16. 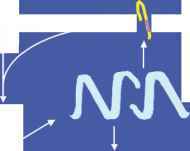 Ribozyme cleavage of RNA associated with cell proliferation role of other cellular pathways in proliferation and cellular damage is being explored by many basic scientists. 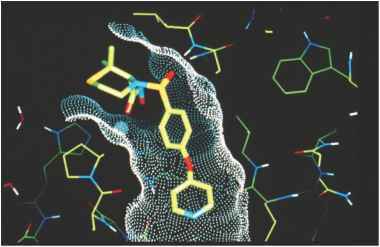 We have yet to take full advantage of molecular drug design to inhibit the pathways involved in PVR. Similarly, as we elucidate the roles of cytokines and develop non-toxic inhibitors of these molecules, we can use this knowledge to inhibit (Fig. 10.17). Similarly, our understanding of what damages the retina after retinal detachment and new drugs to stabilize this delicate neural tissue will be developed, which will also result in better visual outcomes, even in more long-standing macula off retinal detachment. 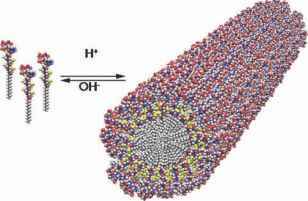 We can now design functional peptide-based drugs and will be able to incorporate signaling peptides into nanofibers (Fig. 10.18) and engineer an instructional matrix for stem cells to replace and repopulate maculae with damaged photoreceptor elements . In vivo fluorescence staining and other cell and molecular techniques are allowing us to visualize pathology in living cells as we see here, using fluorescence microscopy in vivo to follow cell motion with cytoskeletal marker staining. Understanding these fundamental processes will help prevent and treat intraocular proliferative diseases, such as PVR. It is impossible to know what the future holds. The ever-accelerating progress of scientific discovery and the desire of vision scientists and ophthalmologists to help patients will assure us that new and exciting tools and techniques will evolve to take us to where we have not been or even dreamt before.